I recently shared my thoughts on Cormac McCarthy’s novel The Road. Well, I stumbled upon the adaptation on Netflix. So let’s see what’s more captivating – book or movie? So let’s kick it off with some thoughts on the novel. The only word that adequately describes this novel is haunting. There’s not much of an explanation what caused the terrible circumstances the father and son are now facing which makes the story even darker. While reading I had an uneasy feeling that I could never quite shake. The plot is somewhat repetitive with actually works perfectly with the overall theme of depression and no hope. It took me a bit to get used to McCarthy’s writing style and to get into the story in general. But then I was hooked. I am still not the biggest fan of this writer’s style, but the story is captivating. It’s a rather short book, so nothing is lost in case you really don’t enjoy the story. Let’s move on to the film! The Road is a very well-made adaptation. I’m not 100% over the moon, but I was impressed with how well the story was translated to the screen. Some of you may have read my book review on Elizabeth Gilbert’s famous novel Eat, Pray, Love. Of course I also had to check out the movie adaptation starring none other than the wonderful Julia Roberts. So let’s talk about it! Liz is in a very bad place. Going through a terrible divorce which is followed by a tough break up she’s battling depression. That’s when Liz decides to make a change. She packs her bags and embarks on a journey. Over the course of a year she spends time in Italy, India and Bali, learning about the countries, the people but most importantly about herself. I’ll begin with few thoughts on the novel which I really enjoyed. If you want to read the full review, click here. Although I had initially expected this book to be a shallow story that was hyped too much. Well, after reading the first few chapters, my opinion changed completely. Liz Gilbert shared some very interesting and personal thoughts. I highlighted numerous passages throughout the book that offered lots of food for thought and invited further research. Eat, Pray, Love is a rather inspiring novel that will touch you. Today I have a classic for you. 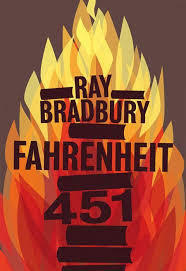 As the iconic novel Fahrenheit 451 by Ray Bradbury got a new adaptation this year, I was inspired to finally see all there about this story! Let’s kick off with the novel. I know this book is famous and praised by critics and fans alike. However, I’m not exactly over the moon. The story and the topics are relevant and Bradbury provides a lot of food for thought. My problem is his writing style and the pace of the story. While the ideas fascinate me, the story bored me. I can’t put my finger on what it is exactly that annoyed me, but I wasn’t excited or thrilled by this book. It just felt flat to me, just as one-dimensional as a world without books. Furthermore, I was rather disappointed with the representation of women in this novel. Bradbury wrote in 1953 and was imagining some far away future, so you might expect him to be a bit diverse with his female characters. However, women generally appear to be brain-washed ideas who are incapable of thinking on their own. There is one exception, but Clarisse also wasn’t a character I liked. She was just weird and irritating, which clearly didn’t help with enjoying the book. It’s book vs. movie time. While I’m waiting for the next season of Hulu’s The Handmaid’s Tale to be released, I decided to check out the 1990 movie adaptation with Natasha Richardson as Offred. Let’s see whether it is any good! To be honest, when I picked up this book, I didn’t really know what I signed up for. I was in Portugal at that time and in dire need of something to read. At a bookstore I found a copy of The Handmaid’s Tale and had a vague memory that there is a supposedly very good TV show about it. Off I went, ready to be impressed. Margaret Atwood did not fail to deliver. From the first page on I was hooked. Somehow torn between wanting to find out more about this terrifying society Atwood writes about and having an urge to put the book down because it feels very realistic, I just couldn’t stop reading. The characters are very well written, so you’ll definitely get emotionally invested. I ended up holding my breath or having to put down the book to simply take a deep breath and let everything sink in. I rather enjoyed how Atwood switched between chapters set in the present day, recounting the day-to-day life of the Handmaid and her memories of pre-Gilead and their rising. Thus, she intensified the feeling how fast this kind of things can happen and that everything can chance without you even being aware. I especially fancied Atwood’s use of certain key sentences that were repeated throughout the book and kept ringing in my head long after I had finished reading.